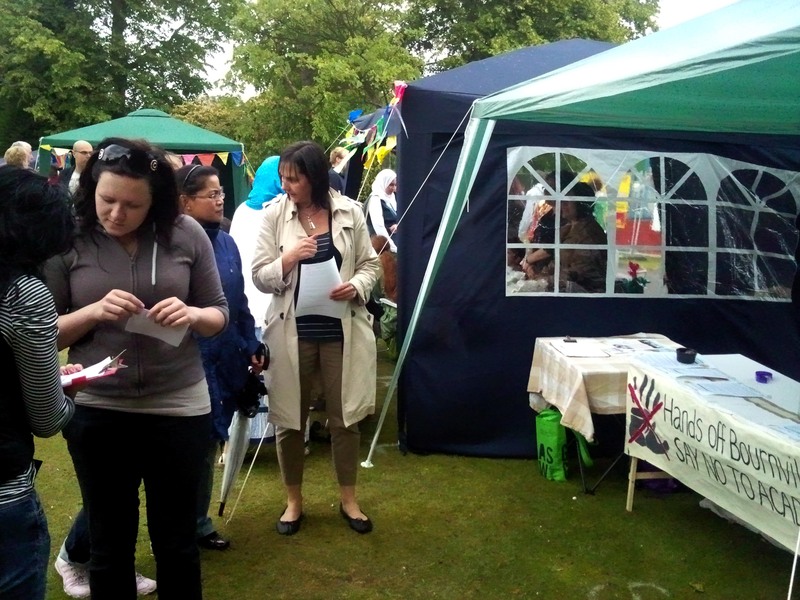 ‘Hands off Bournville School – Say No to Academy Status’ were out on the campaign trail this morning at Selly Oak Festival. Managing to get a stall after a last-minute cancellation, we weathered the wind and rain with the help of a borrowed gazebo and got 80 signatures on our petition. The response from the community was overwhelmingly positive – a great start to our campaign! Thank you to Bob Whitehead who came to the rescue with a couple of clipboards and some Anti Academy Alliance leaflets (we were using dinosaur picture-books and sellotape until then). Now we’ve started there’s no stopping us. Watch this space! As well as Bournville School, Fairfax School in Sutton Coldfield is seeking to move to academy status, and the teachers there have voted to take industrial action, and will be striking on the 28th and 29th June. There is a public meeting held by Alliance Against Birmingham Academies, about the strikes at Fairfax School, Sutton Town Hall on the 27th, from 7pm. Teachers in the NUT and ATL unions have voted in favour of taking strike action over changes to pensions. 92% of NUT and 83% of ATL members voted yes – a huge mandate for action, especially for ATL, which has not been on strike since the 1960s. These are the first of the unions balloting for action on 30th June to declare – PCS results are expected later this week, whilst Unison – who are balloting council workers in Birmingham for 2 days of strikes – will come next week. The unions say the pensions changes will leave them working longer, paying more and getting less when they retire. Contributions to the scheme will rise, by up to £1,250 / year for teachers, whilst the retirement age will be increased and pensions payments reduced, firstly by moving from RPI to CPI to calculate increases, and secondly by changing from a final salary scheme to a career average scheme. At our public meeting on May 26th, Doug Morgan from NUT spoke about public sector pensions, debunking some of the myths surrounding “gold-plated” pensions. The average public sector pension is around £4,000 per year. He also argued that the only thing maintaining private sector pensions (which he described as awful) were the public sector pensions (described as OK). Doug will be speaking at the Stockland Green Against the Cuts meeting on Wednesday (tomorrow). If you live in North Birmingham, why not go along and hear first hand about why both parents and private sector workers should be supporting the strike. We need to support teachers in their action to defend their conditions. This is not a selfish action, but an action taken to defend a vital public service. I think it is fair to say that everyone benefits from a strong public sector education system, and an attack on the teachers is an attack on schools. Parents, let your teachers know that you support them in this action. Anything which reduces the rewards for doing an often very difficult and emotionally hard job reduces the quality of people who will consider doing that job. Standards of teaching haven risen vastly in this country over the past decade, in no small part because of the extra investments that have been made, including pay rises. Worsening the pension scheme will only act as a disincentive to enter or stay in teaching, so although it will be annoying having to work out what to do if your child’s school closes for the day, this strike is about the long term future of their education. And we are of course encouraging everyone to take two days annual leave for the 29th and 30th – two days we hope will be packed full of anti-cuts activity. So if your child’s school closes on 30th June (and we hope that lots of schools will be closed), why not bring them along to the strike rally? 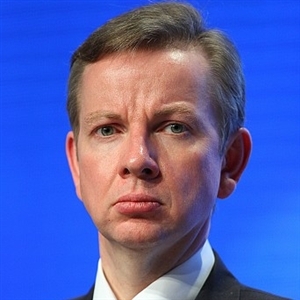 Much of the attention of the coalition government’s funding of English maintained schools has focused on the cancellation of the Building Schools for the Future programme. Almost no attention has been focused on another aspect of capital funding that will affect all schools – that of Devolved Capital Funding. This is the annual allocation to schools for minor capital repairs and refurbishments introduced by the last government. This is a cut of just over 80%. The 2011-12 figures are on the DFE website here. The 2010-11 figures are here. Tuesday 11 January. Richard Hatcher spoke with powerpoint presentation to meeting of around 25 governors of the Four Oaks cluster of 9 primary schools at Hill West primary, organised by the head, Beth Clarke. Wednesday 12 January. About a dozen Alliance Against Birmingham Academies (AABA) supporters leafleted a meeting at Rookery primary school Handsworth organised by the head, Tracy Stone, with a speaker from Anthony Collins, Birmingham solicitors specialising in Academy conversion. (We hear that the chair of governors is employed by Anthony Collins – we’re following this up.) Heads of the 29 schools in the Handsworth Association of schools were invited – 12-15 attended. AABA has asked to speak at a future meeting of the HAS and we are hopeful of being included in the February meeting. Richard Hatcher spoke with powerpoint presentation to meeting of heads of the 26 primary schools in the Sutton Coldfield consortium, organised by the head, Beth Clarke. The response at the Four Oaks and Sutton meetings can be summarised as: we don’t like Academies, we don’t want to leave the Local Authority, though we have criticisms of it, we don’t like the cuts, we don’t like being blackmailed by the government into becoming Academies, but if it’s a choice between that and losing jobs we reluctantly will. So all depends on the school budget allocation to be announced next month. However, a trickle of secondary schools are already taking the decision. Ninestiles and Arthur Terry/Stockland Green have already decided, as have the 5 King Edward grammar schools. We have just learned that Lordswood Girls, Bartley Green, Perry Beeches and Kings Norton Girls are planning to convert. Unions need to rapidly contact their reps and members and arrange meetings. One factor in schools deciding is the support services the LA can offer. They are now being turned into semi-privatised traded services, putting staff’s jobs and the survival of services at risk. The Campaign to Retain Our Support Services – CROSS – has two important activities in the next few days. They need our support. Saturday 15th January – Petitioning outside Waterstones, Bullring, Birmingham City Centre. Before Christmas, we managed to collect almost 2000 signatures. A brilliant start but we need thousands more. Forthcoming Meeting Monday 31 January 6pm – AABA planning meeting – NASUWT offices, Ludgate Ct, Water St. You are very welcome to attend. Please let us know if you are able to help with leafleting etc or have useful contacts – or if you have information about Academy and free school developments. The meeting will include a report back from the Anti-Academies Alliance AGM this Saturday. To coincide with the vote on EMA in parliament, Stop Fees and Cuts Birmingham have called for people to write to their MP and councillors to help to prevent EMA – a means-tested payment made to students in Further Education – and to attend a demonstration in Birmingham City Centre from 4pm, January 11th, meeting by Waterstones near the Bullring.